​Water damage restoration requires lots of specialty equipment to dry all types of structures and contents. You can be sure that Althouse has the correct equipment and training. 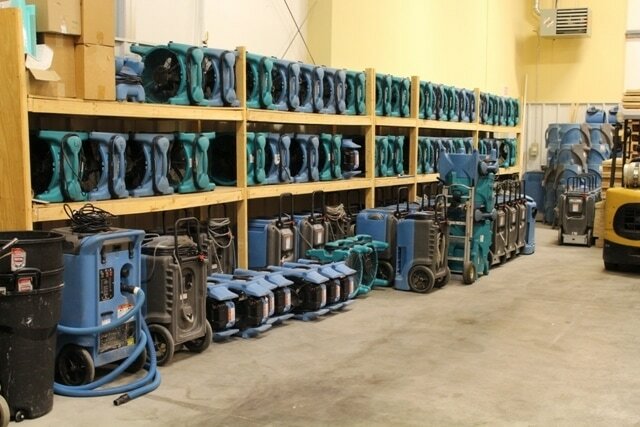 We have hundreds of air movers, dehumidifiers, rescue mats for wood floors and lots of specialty equipment for problem drying. Our competitors rent equipment from us because we have so many different types. Water Damage Restoration technicians use moisture probe to determine the size of area that water has spread. The probe allows the technician to "see" if the pad is wet, even when it is covered by dry carpet. Moisture probes are fairly simple battery powered devices. The probe has two very sharp prongs that stick through the carpet to the pad and sub-floor. When the prongs are surrounded by a wet material a circuit is completed and creates a beeping sound in the moisture probe. Some units just make a sound, others indicate more moisture content by beeping more rapidly. The technician walks about the room carrying the sensor like a cane; sticking the prongs into the carpet. This gives the technician an fairly clear idea the extend of the spreading water. The probe does not damage the carpet in any way. It is very important that the technician monitor the drying progress over a few days and to be able to say when the structure is dry enough to pose no threat of mold or bacteria multiplying. Moisture meters come with various features. One type of meter that Althouse Restore technicians use is called a thermohygrometer. It measures temperature, relative humidity and specific humidity in the air, as well as the moisture levels of in various materials such as wood, Sheetrock brick, etc. After the initial water restoration visit to extract water and set up drying equipment, Althouse technicians return on a daily basis to document the drying process. This is done by measuring, using the thermohygrometer, every room, floor area, cabinet group and wall to determine if they are properly drying. All readings are documented. Drying equipment may be moved, re positioned or removed according to what is called for using IICRC's principles for Applied Structural Drying.